Organizational change is a reality of 21st-century working life, but what psychological effects does it have on individual workers, and what coping strategies can be used to mediate its impact? In today’s turbulent work and career environment, employees are required not only to accept changes as passive recipients, but to proactively initiate changes and demonstrate attitudes, behaviours and skills valued by current employers. As a result, organizational psychologists, both researchers and practitioners, have had to acknowledge and understand the myriad of challenges faced by employees as a result of organizational change. 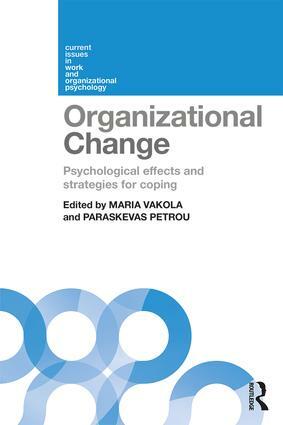 Analyzing and presenting the impact of organizational change, and possible coping strategies to successfully manage change, the volume is ideal for students and researchers of work and organizational psychology, business and management and HRM. Current Issues in Work and Organizational Psychology is a series of edited books that reflect the state-of-the-art areas of current and emerging interest in the psychological study of employees, workplaces and organizations. Each volume is tightly focused on a particular topic and consists of seven to ten chapters contributed by international experts. The editors of individual volumes are leading figures in their areas and provide an introductory overview. Example topics include: digital media at work, work and the family, workaholism, modern job design, positive occupational health and individualised deals. Professor Sir Cary Cooper, CBE is the 50th Anniversary Professor of Organizational Psychology and Health at the ALLIANCE Manchester Business School, University of Manchester, President of the CIPD, President of the British Academy of Management, President of RELATE, and President of the Institute of Welfare. He is a Companion of the Chartered Management Institute and one of only a few UK Fellows of the (American) Academy of Management.